In this investigation, we synthesized monophasic and nanostructured (Zn1-x-yFexCoy)O samples, with x + y = 0.05. These nanophases were characterized by X-ray diffraction, magnetization techniques, and Mössbauer spectroscopy. The analyzes revealed that doping ZnO with iron or cobalt induced a morphological change for the crystallites. The presence of cobalt in the matrix showed to enhance clustering of iron atoms and two different groups of ferric cations were identifyed diluted in the wurtzite matrix. (Zn1-x-yFexCoy)O has no magnetic order at RT but makes a transition from the paramagnetic to the spin-glass state with decreasing temperature, passing through three different magnetic regimes. The unit cell volume, remanence and coercive field of the (Zn1-x-yFexCoy)O solid system reached a maximum for co-doped samples. 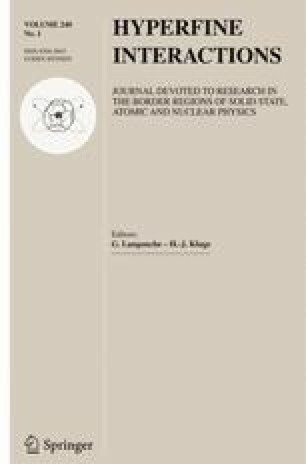 The online version of this article ( https://doi.org/10.1007/s10751-019-1571-1) contains supplementary material, which is available to authorized users.